A major breakthrough in cancer immunotherapy was the discovery of immune checkpoint proteins, which function to effectively inhibit the immune system through various mechanisms. The first of such molecules shown to inhibit both T-cell proliferation and IL-2 production was cytotoxic T-lymphocyte associated protein 4 (CTLA-4). With this discovery, efforts turned to blocking this inhibitory pathway in an attempt to activate dormant T-cells directed at cancer cells. The first antibody directed against CTLA-4, ipilimumab, was quickly ushered into clinical trials and was approved by the US Food and Drug Administration (FDA) for the treatment of metastatic melanoma in 2011. Following the success of ipilimumab, other immune checkpoints were studied as possible targets for inhibition. 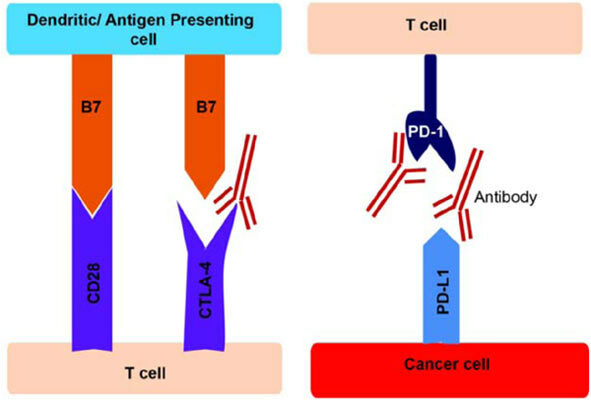 One such interaction was that of the programmed cell death-1 (PD-1) T-cell receptor and its ligand found on many cancer cells, programmed death-ligand 1 (PD-L1). Unfortunately, the untoward effects of blocking the immune system’s natural inhibitory mechanisms have manifested clinically as diarrhea, rash, and hepatitis. Nevertheless, the exciting field of immune checkpoint inhibitors offers a potential curative option for many cancer patients who previously had a more dismal prognosis. The authors aim to provide a comprehensive review of the literature and update on the use of CTLA-4, PD-1 and PD-L1 targeted therapy in the treatment of cancer and other molecules still in the early development phase. Cancer, CTLA-4, inhibitors, immune checkpoint, PD-1, PDL-1. Thoracic and Gastrointestinal Oncology Branch, National Cancer Institute, National Institutes of Health, 10 Center Drive, Room 3W5848, Bethesda, MD 20892, USA.